Having recently become familiar with Zegna upon moving to Italy, I have been very impressed by their craftsmanship and elegance. Yesterday we took a side trip to the Zegna factory located little just over an hour outside Milan in a lovely town called Novara. As it is the last in the company to be redesigned, the factory was surprisingly dingy (traditional 3-story walk-up factory with no AC) for such a high quality production facility, as not only the Zegna suit jackets, but also jackets for licensed brands such as Versace, Gucci, Daniel, Yves Saint Laurent, and the almighty Tom Ford are made there. 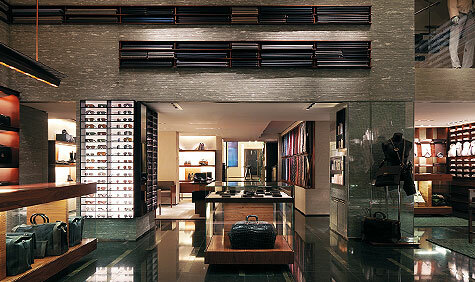 The same workers produce for all labels, although Tom Ford has some specifically devoted to his line, as it requires some very detailed processes. However, as part of their licensing agreement, Zegna designers never see the production facilities, preventing any risk of unethical intellectual property transfer from the other brands. The system of production is really interesting, because the typical men’s suit jacket is made from over 160 (!) different pieces sewn together, taking on average 6 hours for production. The jackets have a structure that is created through stacking layers of canvas and other fabrics, providing both a strong form and flexibility. In high-quality suits, the “stacking” is achieved through a “canvasing” process, where the layers are sewn together. Lower quality suits use a “fusion” process, were glue is used instead of stitching to achieve the effect. One of the extra components in the Tom Ford suits are the extra canvasing layers around the breast, accentuating the appearance of pectoral muscles! The process begins with fabric components, all of which are cut in Switzerland. Each designer brand sends their drawings and patterns, as well as fabrics to the factory where the fabrics are cut into the appropriate shapes. Most (75%) of these fabrics come from Zegna (which began as a textile manufacturer), but if synthetic fabrics are required, they are outsourced. Before construction begins with new materials, the seamstresses do several test experiments to determine whether the fabric is appropriate for suit orders. The jacket components are then put into boxes and delivered to the seamstresses with a Bill of Materials, telling her precisely what she needs to do with the material, the exact color thread to use, etc. A seamstress will only repeat a process 7 times, as Zegna wants the jackets to be of the highest quality, and frequent reproduction causes boredom and mistakes, while some repetition is needed to learn the process. The jacket front is made in this way, and then the outer, visible layer is attached with a special machine that stitches identical rows of supportive threading that is invisible from the outside. A white thread is stitched throughout the jacket to pucker the material in some places that will need to hold a curve, and in general this temporary stitching holds the stacked layers in place until finishing occurs. After a quality check, the jacket is dropped through a laundry shoot from the third to the second floor, where it is picked up by the next cycle of workers. Here the shoulders are sewn in (these are NOT shoulder pads, but rather a layering of thicker canvas and padded fabric no thicker than 1 cm), and then the collar. Sleeves are outsourced to local manufacturers because the factory is too small, and this is the least technically complex component. These sleeves are attached after the buttonholes are carefully cut and stitched. This is an important detail as many men who own bespoke suits will unbutton the last two sleeve buttons to demonstrate that the suit is genuine. Entering the final phases, the white thread that holds the layers in place is removed, a lining is added along with the ever important label (with the exception of Tom Ford’s, which is done by hand), and the jacket is sent out to local artisans who work from home. These people will provide the finishing details by hand. For example, a Tom Ford suit jacket has a collar button hole that takes 30-45 minutes alone to stitch, and must be done by hand. If you take a close look at the inside of a jacket button hole, you will be able to see some inner layers of the stacking process. In this one Tom Ford button hole, the finishing occurs by hand in a cylindrical shape around the cut, preventing the exposure of interior layers. When the jacket comes back from the domestic seamstresses, a final ironing takes place before the jackets are sent to the warehouse for shipment. The only remaining sartorial effects are white stitching in the shoulder line, which is removed when the jacket is purchased (this is more for marketing than anything else), and the light stitches that hold the Tom Ford button hole closed. Two quality checks are performed for stitching and details, and for the overall jacket on a sewing form. As an aside, Versace is dressing Patrick Dempsey these days. We were particularly excited to see his size 48 Versace jackets being carefully constructed to order by seamstresses who had plastered his picture to any available surface near their sewing machines! 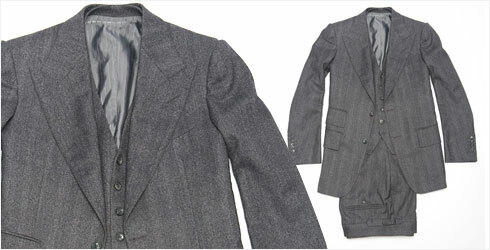 Made to measure jackets like his can take up to 4 days to manufacture.